We had only visited the Palm Springs Area once before we had the opportunity to purchase our condo. 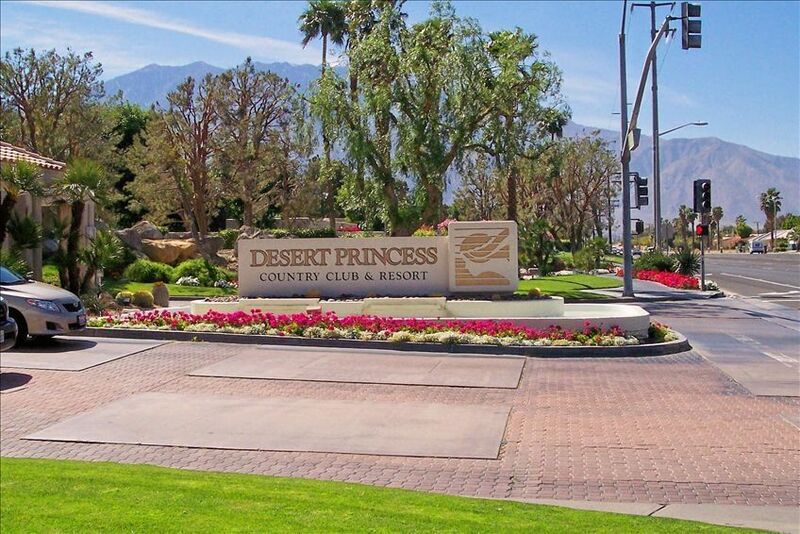 After seeing the beautiful golf course and other emenities, we fell in love with the Desert Princess and we knew we wanted to be a part of it. When we purchased our condo, I knew it would be something special. I really enjoy getting to know people and catering to their distinctive personalities. The home is decorated with the locale in mind. Everything from the Indian motif dishes to the Palm trees on the shower curtain was purchased with our guests in mind. It is very comfortable and all who visit seem to really enjoy it! Parking is available off the street. You will have access to a one car garage. All towels are provided; bath, kitchen and beach towels. There is a gym available through the Country Club. Coffee & tea are always in the cupboard. Creamer & sugar provided. You will find bottled water, paper goods and cleaning supplies upon your arrival. Some condiments and spices will be in the unit for your use. There is service for at least eight. You will love our kitchen. There is a window over the sink with a view of the golf course. The eating area is large enough for 6 by adding a couple of extra chairs. (3) In livingroom and each bedroom All new flat screens. Bicycle is in the garage. Also, have helmet. Patio right off the livingroom. Has 6 chairs and patio table, two chase lounges. Patio fronts the golf course. Need to rent or bring your own clubs. Special discounts on golf at the DPPC. A very comfortable condo. Susie is very attentive in ensuring her guests are comfortable. The condo is equipped with everything you need. Thank you for your nice comments. I'm sorry the weather didn't cooperate for the additional golf outings you might have liked to enjoy. We have been experiencing a severe drought for several years and we really needed all the rain. This year was exceptional. Thanks again for being our guests. From the time of the initial booking till the end of our stay we could not have asked for a better experience. We have stayed at several condos in Desert Princess but Sue went the extra distance to ensure that a guest’s experience is enjoyable. The condo is very comfortable and spotless. Excellent condo,clean and equipped with all you need.Owner is a delight to deal with. Tony and Susie's condo was the perfect size for for a month getaway. We shared with another couple and the fact that we each had a bathroom was perfect. The condo sits right on the fairway of one of the 3 nine-hole golf courses at the resort so the view was beautiful! The pool (1 of 34 pools) was just across the driveway and was never crowded. Susie has supplied the condo with everything you could possibly need and she was wonderful to work with! I would totally recommend this condo. I would like to thank Sue and Tony for renting their condo to us. When we arrived at the condo, I was really impressed how clean and comfortable this condo was. This condo had everything you needed to start your vacation. It was located on the 7th hole of the golf course which gave you a wonderful view. Sue was a wonderful person to deal with and I would totally recommend this condo.